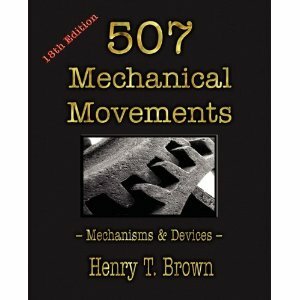 This is an excellent book for inspiration on mechanisms. It was first published around the turn of the century and has had many editions. There are pictures on one page and explanations on the opposite. They have retained the original drawings and text, so everything on the inside looks old fashioned. Some of the illustrations and explanations are quite short and simple, but you can often still figure things out. Many terms are not explained, as much of the book is meant for an audience who knows these things already. However, you soon learn by context what it's talking about. There are many ingenious mechanisms in this book; I will try to replicate some with my Lego Mindstorms kit and post about them. They'll be labeled with the tag "replications."